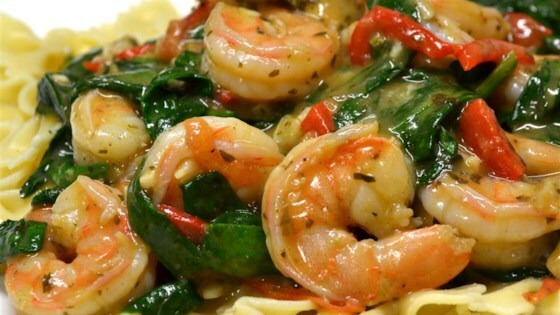 "This shrimp scampi has the fresh flavors of tomatoes, spinach, and pesto. Serve over rice with hot Italian bread on the side." Combine the butter and the olive oil in a large skillet over medium heat. Stir in pesto, garlic, and tomatoes, and simmer until the tomatoes start to soften, about 2 minutes. Season with red pepper flakes and black pepper to taste. Stir the shrimp into the sauce, and cook just until they turn pink, 3 to 5 minutes. Add the spinach, and stir until wilted, about 1 minute. I've made this twice now and both times it has been a big hit! The only difference is I added thinly sliced onions and peppers. It has been such a big hit, can't wait to make it again!! This was excellent! I loved all of the flavors. I served it over penne pasta. I used canned tomatoes and also added artichoke hearts. Would be great with chicken, also.